Looking for a way to use up leftover corned beef? These scrumptious corned beef taquitos are just the thing. And even better, serve them with a delightful quick and easy avocado sauce! In a blender, add all ingredients and blend on the sauce setting. Blend until the consistency of sauce is smooth. If the sauce is too thick, add a little more water. Taste test and add more salt if needed (just enough salt will bring out the flavors nicely). Pour the sauce into a food storage container, or serving dishes (covered with plastic wrap) and chill in the fridge while making the taquitos. Rolling the Taquitos - Make sure that the meat has had to chance to sit out on the counter for about 10 minutes so that it's at room temperature; using a paper towel, pat the meat so that it's completely dry (this is done to help prevent the hot oil from popping when the meat-filled taquitos are cooking). Heat a small to medium-size skillet on medium heat and add canola oil. Let the oil warm for a moment and then turn off the heat. Using tongs, carefully dip a tortilla in the oil for just a moment (to make it soft enough to roll without breaking), then quickly remove it from the oil and transfer it to a large plate. Starting at about 1-1/2 inches from the edge of the tortilla that is closest to you, lay some of the shredded corned beef, (about 1/12 of the total amount) in a horizontal line about 1/2 inch from each side of the tortilla. When the tortilla is cool enough to touch, carefully roll it as tightly as possible. Set aside and repeat the process with the rest of the corned beef. After rolling about 4 tortillas, the oil will need to be warmed up again; repeat the process by turning the heat on and off again (so that the oil doesn’t get too hot). Cooking the Taquitos - once all of the taquitos are wrapped, heat the skillet on medium heat and add more oil if needed so that the oil is about ½ inch deep in the pan. 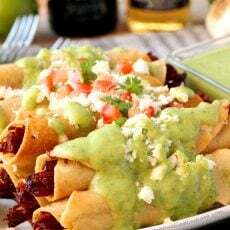 Using tongs, fold side-down, carefully add 3 to 4 taquitos in the pan (amount of taquitos added depends on the size of your pan); cook them in batches so not to overcrowd them. Be very very careful not to let the oil get too hot or it will cause the meat to have moisture and the oil will pop. Turn the heat down immediately if the oil gets too hot (and stand away from the pan). When the bottom sides of the taquitos are a golden color, use tongs to turn them over. Continue to cook the taquitos until all sides are a golden color. Remove the taquitos from the skillet and lay them on to a paper-towel lined plate. Serve warm with avocado sauce. Optional - garnish with cilantro, crumbled queso fresco cheese and diced tomatoes. Make sure that the meat has had to chance to sit out on the counter for about 10 minutes so that it's at room temperature; using a paper towel, pat the meat so that it's completely dry (this is done in an effort to help prevent the hot oil from popping when the meat-filled taquitos are cooking).